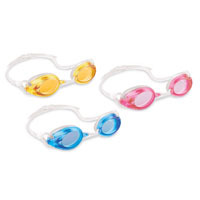 Gear Aid Sea Drops Anti-Fog Lens Cleaner, 1. Gear Aid Sea Drops Anti-Fog Lens Cleaner, 1. 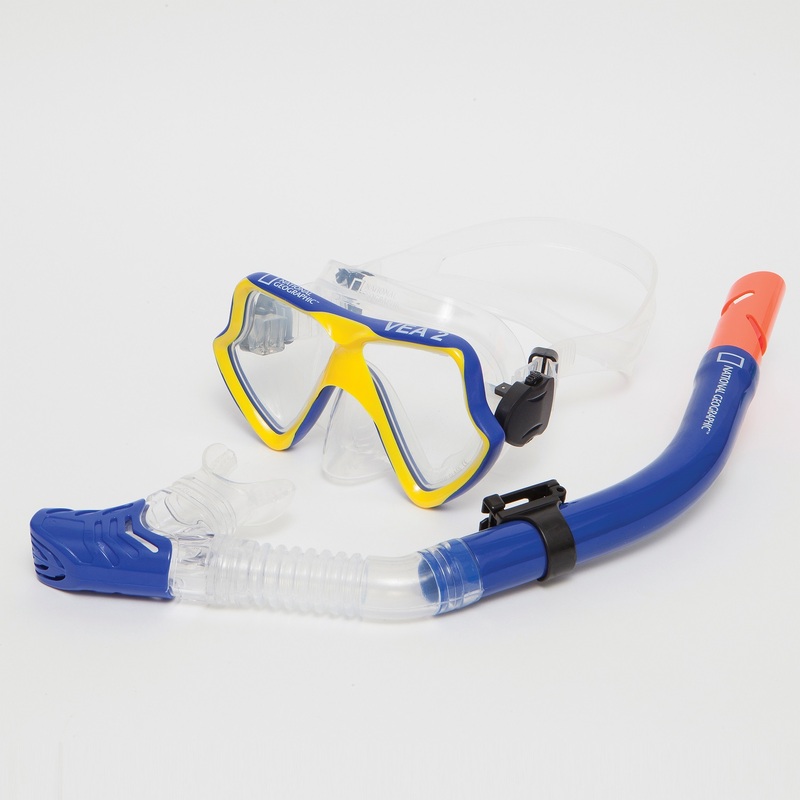 National Geographic is synonyms with adventure, and this Fit Traveler Mask and Snorkel Set (Blue)-Explorer Series is your key to unlocking the adventures of the underwater world. The Fit Traveler mask is a center-fitted snorkel which allows free use of your arms so you can swim a variety of strokes at home, on the reef, or in the pool. 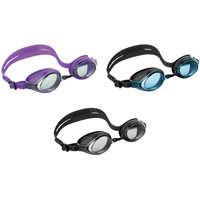 The two lens mask has a great field of vision, made from 100 percent hypoallergenic silicone rubber with a lightweight Delrin plastic frame, and adjustable silicone rubber head strap for maximum comfort and fit. 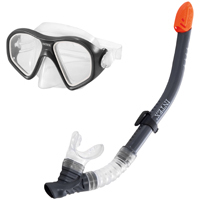 Mask has a unique front snorkel clip centered between the two lenses. 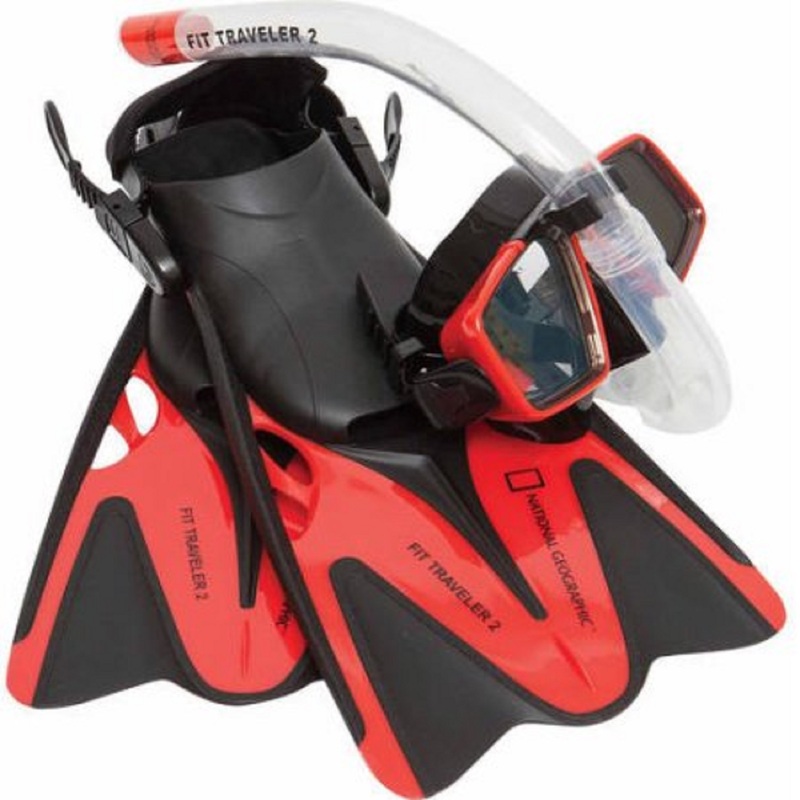 National Geographic is synonyms with adventure, and this Fit Traveler Mask and Snorkel Set (Red/Black)-Explorer Series is your key to unlocking the adventures of the underwater world. The Fit Traveler mask is a center-fitted snorkel which allows free use of your arms so you can swim a variety of strokes at home, on the reef, or in the pool. The two lens mask has a great field of vision, made from 100 percent hypoallergenic silicone rubber with a lightweight Delrin plastic frame, and adjustable silicone rubber head strap for maximum comfort and fit. 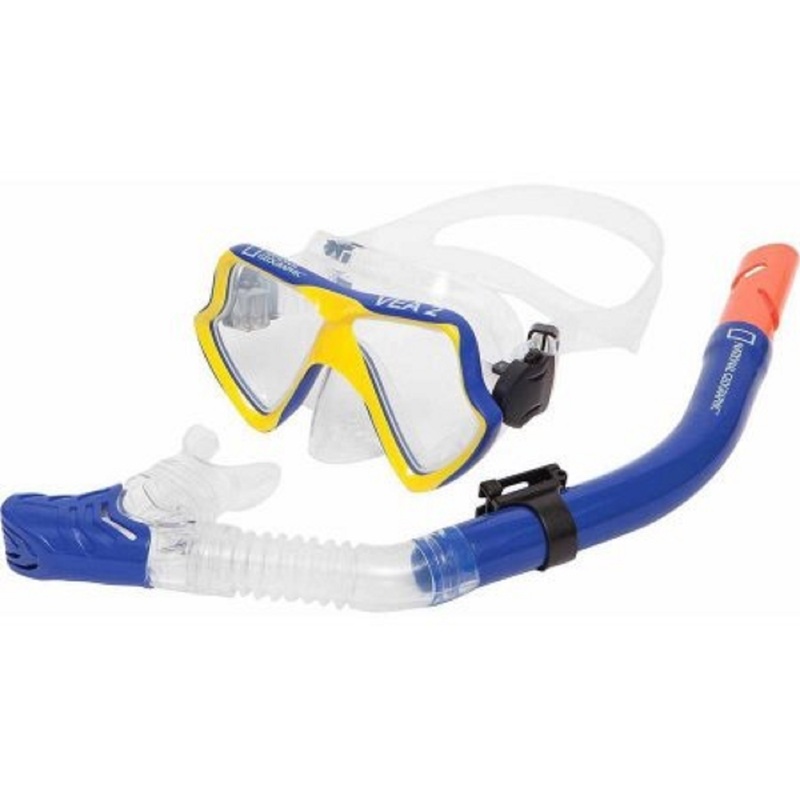 Mask has a unique front snorkel clip centered between the two lenses. 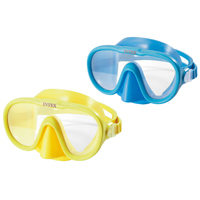 The National Geographic Snorkeler Tunny2 Set (Yellow/Black ML/L 9-12) has CE tempered lenses for safe distortion free clarity. 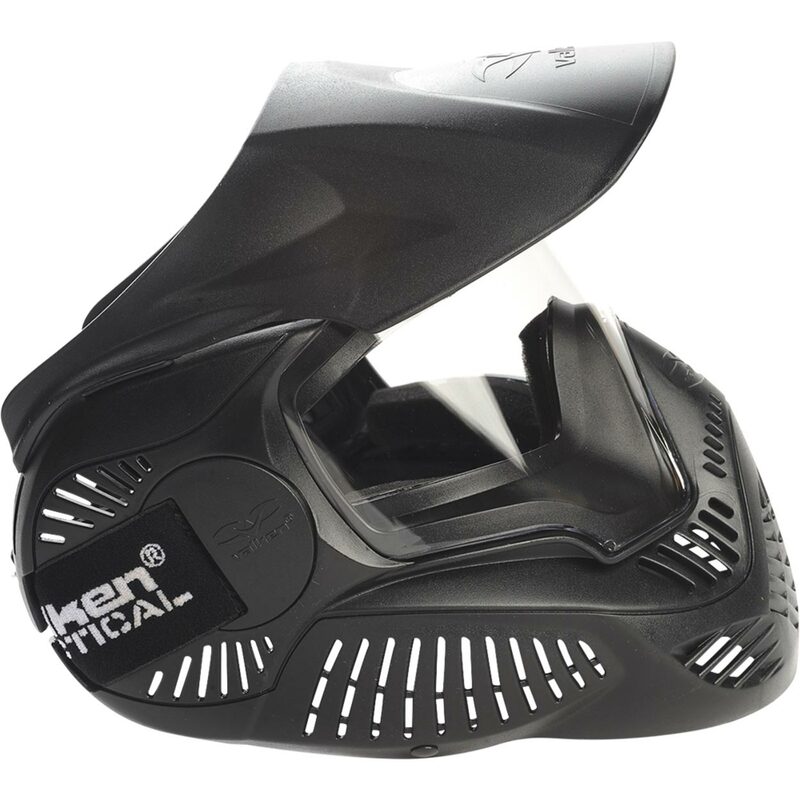 Lightweight Delrin and advanced lightweight plastics frames. Feathered edge mask skirt seals comfortably and distributes sealing pressure. Pliable non feathered nose piece for ease of equalization and mask clearing. G++Ratchet quick lockG+- masks strap adjustment. 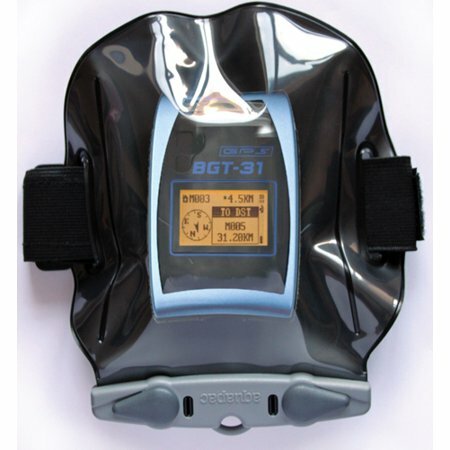 Flexible replaceable mask strap with G++3 point holdG+- design. Snorkels - Orthodontic designed mouth pieces to avoid jaw fatigue. Easy mount snorkel tab to secure snorkel to mask. Wide bore tube for proper air displacement and exchange. 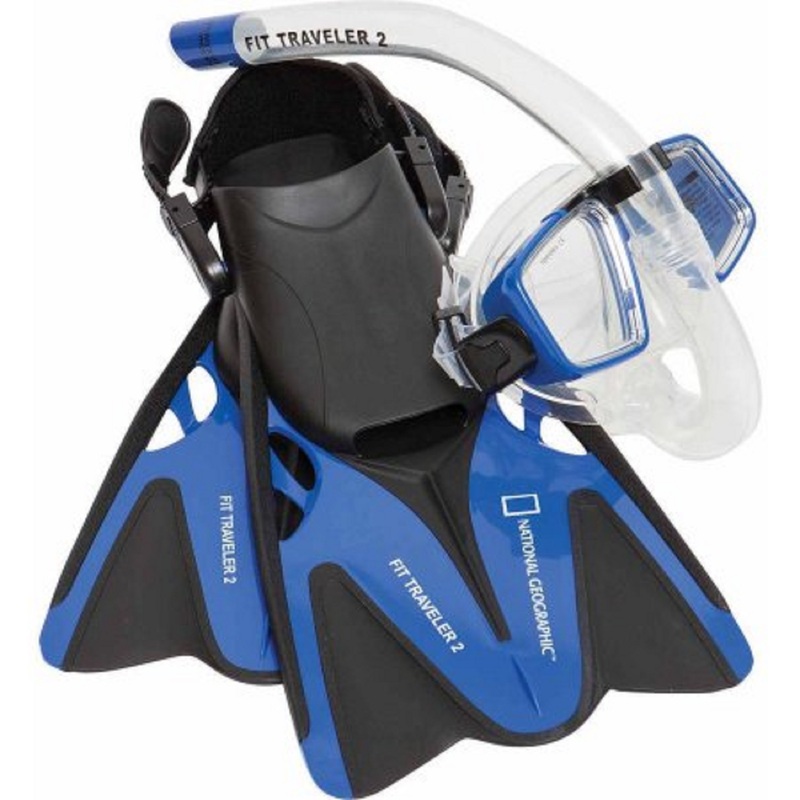 Properly sized components to accommodate widest range of snorkelers. Variety of splash guards to keep the snorkel G++dryG+- under most conditions. Fins - Soft comfortable foot pockets available in a full foot or adjustable open heel. G++Ratchet Quick LockG+- system is utilized on the open heel design with the option of replaceable fin straps. Both designs can be worn with or without additional foot protection such as Bootie or Neoprene socks. Blades made from carefully selected composites to maximize the G++snap & flexG+- for the desired task, combining as many as three different materials to achieve the appropriate desired thrust to energy exertion ratio. Variety of blade styles allow for a proper selection whether going for a gentle leisurely swim over a reef or burning calories in the lanes of a local pool. The National Geographic Snorkeler G++Carry BagG+- can be comfortably used to carry your Snorkeler equipment to and from your water based activities time and time again! 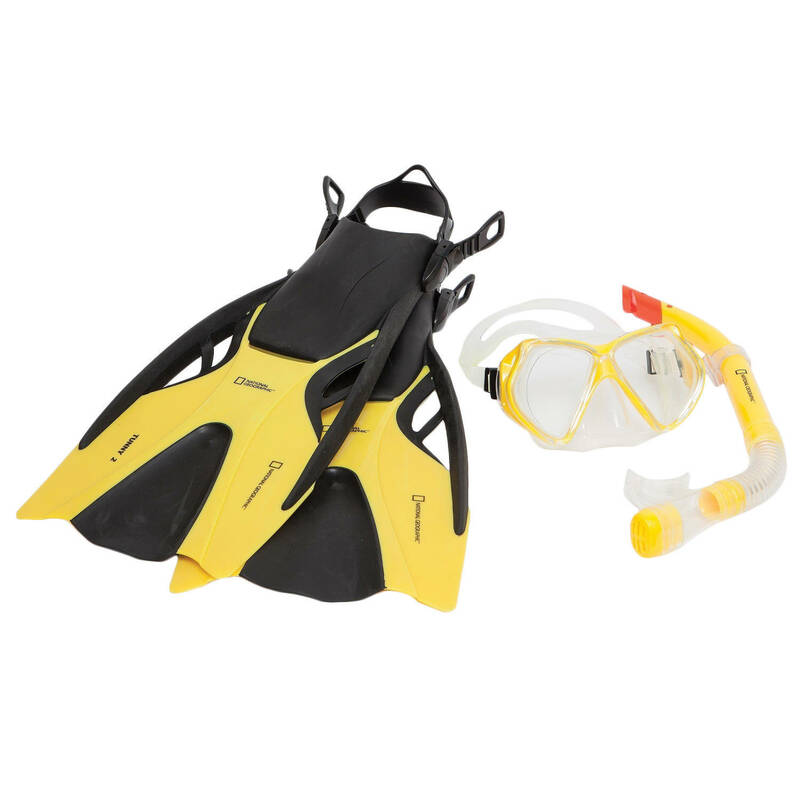 The National Geographic Snorkeler VEA2 Combo (Medium) includes VEA Mask with a matching-size Viva Dry Snorkel for an optimum fit. This combo is made of the highest quality and comfortable materials intended for extended range and depth. Combo is packaged in an environmentally friendly day bag. 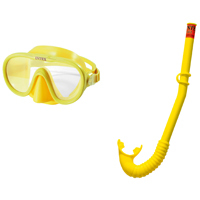 The National Geographic Snorkeler VEA2 Combo (Small) includes VEA Mask with a matching-size Viva Dry Snorkel for an optimum fit. This combo is made of the highest quality and comfortable materials intended for extended range and depth. Combo is packaged in an environmentally friendly day bag. 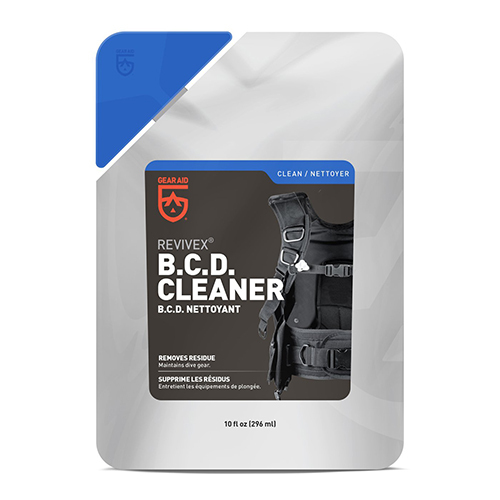 GEAR AID makes it quick and easy to clean and condition all types of dive equipment with Revivex B.C.D. Cleaner and Conditioner, previously known as BC Life. This complete and balanced maintenance system effectively removes salt and chlorine crystals from the inside of the bladder and breaks down salt and chlorine on the outside, too. With its silicone conditioning formula, this cleaner extends the life of all B.C.D. parts, from rubber fittings and valves to the shell. 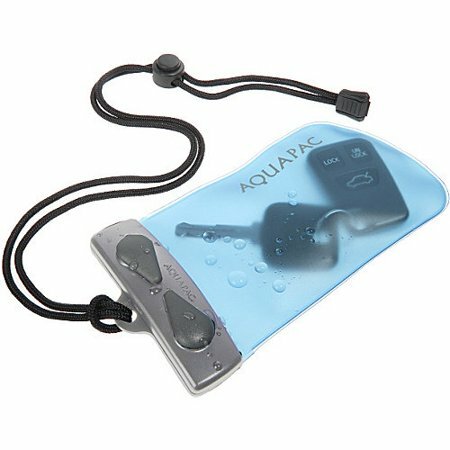 It�s safe to use on all dive equipment and scuba gear. Regular B.C.D. cleaning and conditioning is important. And with Revivex B.C.D. Cleaner and Conditioner, it�s easier than ever to keep dive gear cleaner and make it last longer. 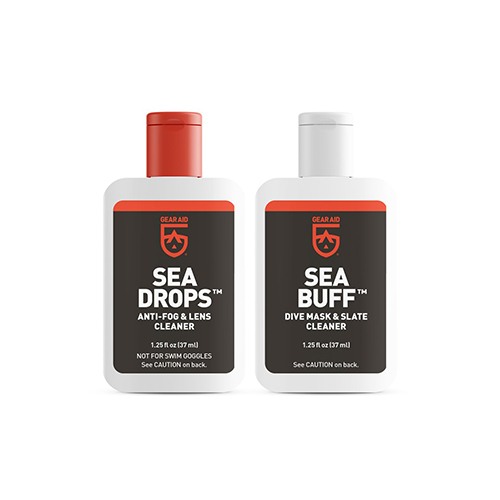 Sea Buff Pre-Cleaner and Sea Drops Anti-Fog combo pack. 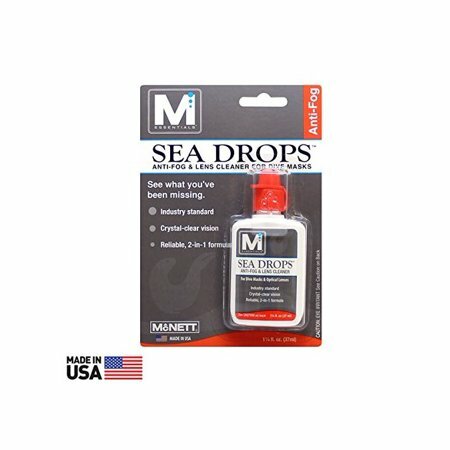 Sea Drops Size: 1 1/4 fl.oz. Sea Buff Size: 1 1/4 fl.oz. 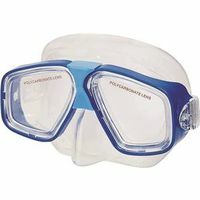 When you�re scuba diving or snorkeling, there�s nothing more annoying than a fogged-up dive mask. So why mess around with just any anti-fog treatment? De-fog with Sea Gold. 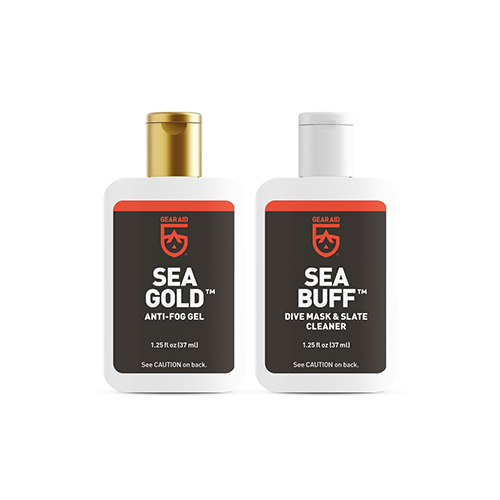 Sea Gold by GEAR AID is a powerful formula that lasts longer than other anti-fog treatments. It�s highly concentrated, so a little goes a long way. And it�s even effective through multiple dives. Use in any water temperature and in any conditions. It�s safe for glass and plastic lenses, and won�t harm silicone or rubber mask frames. Avid scuba divers, instructors and professional gear testers alike agree: Sea Gold is the best anti-fog treatment out there. Use Sea Gold and you�ll enjoy diving as it was meant to be: completely fog-free. Whether you're in the middle of an intense swimming competition or just swimming for recreation, hair can be a real drag! 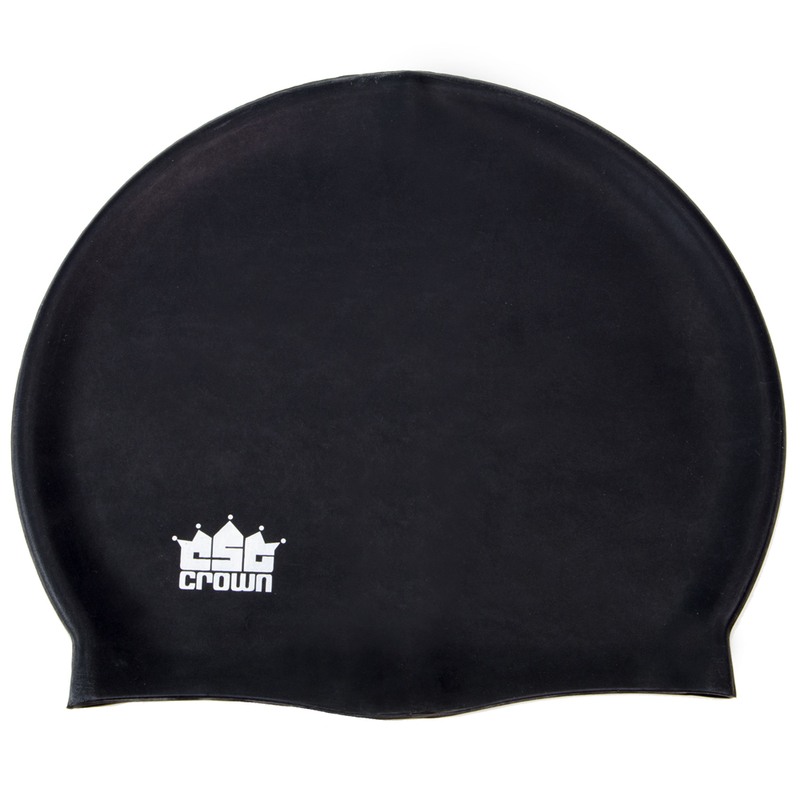 You can reduce drag for better hydrodynamic performance and protect your hair from chlorine damage with a swim cap. Our swim caps are made from stretchy 100% silicone material, resistant to potential rips and tears. You'll find these caps keep hair in the cap and the water in the pool. 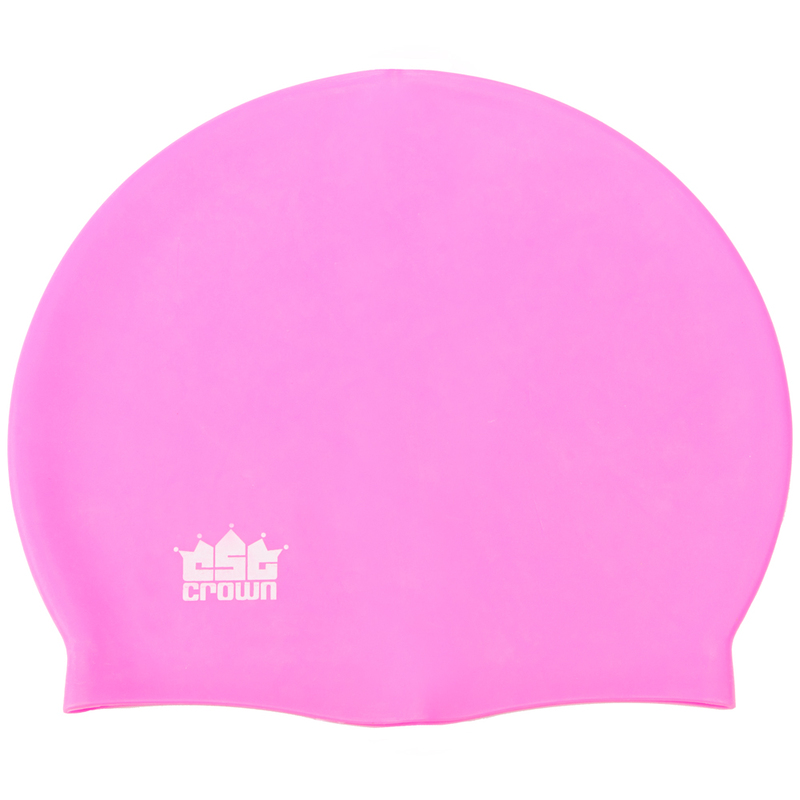 Swim caps are simple to use and you can take it off without worrying about hair getting pulled or stuck. 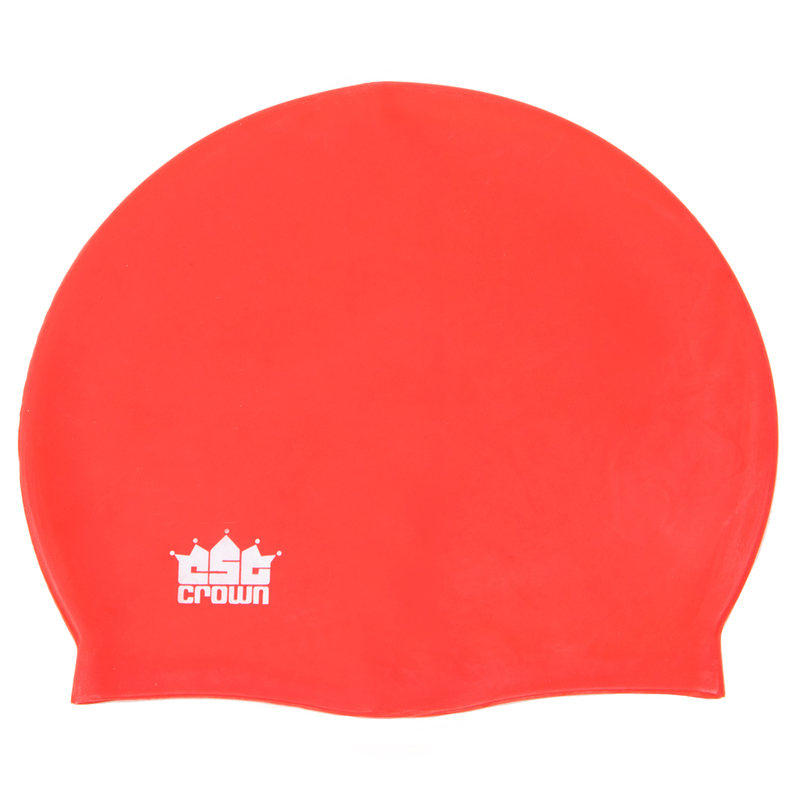 Our swim caps come in one size and they stretch out to fit most head sizes for maximum comfort. The swim cap fits over both short and long hair alike. These caps keep your head warm and tight minus the usual pressure you feel with rubber latex swim caps. Our swim caps are resistant to tearing and rips, which can happen from extended use. These caps help prevent common Recreational Water Illnesses (RWIs), especially swimmer's ear. For best use, lightly dampen your hair in a bathroom or locker room and pull the cap over your head. 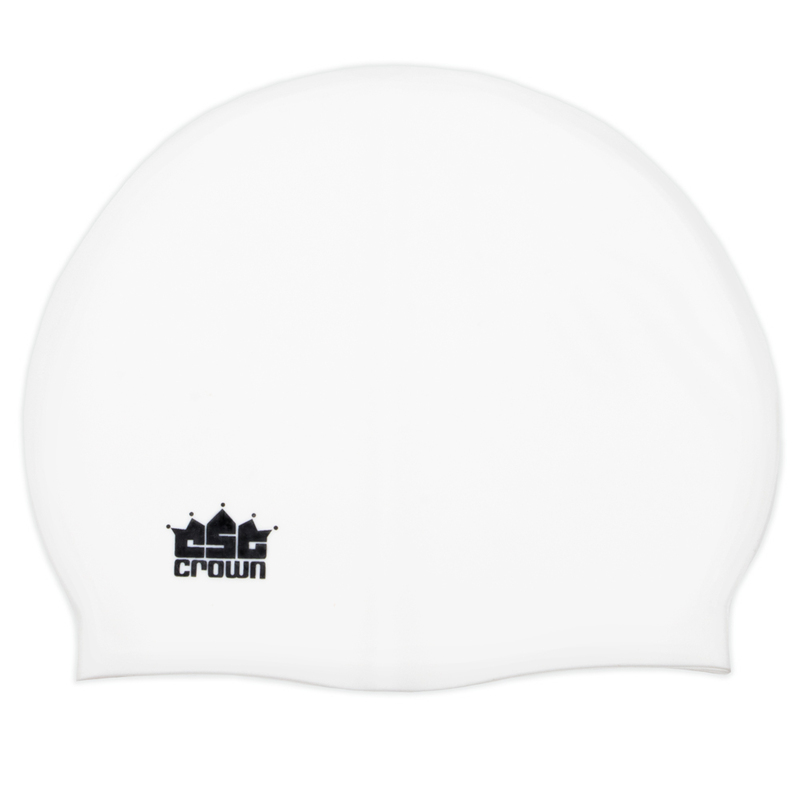 Make sure to wipe your cap dry on the inside and outside with a towel immediately after use. To keep your swim cap in good condition, add a light sprinkle of talcum powder on it or in the convenient zip bag that is included. The Zanheadgear Neoprene Face Mask features full coverage of the face and ears with stretchy, warm and water resistant 2mm thick neoprene. 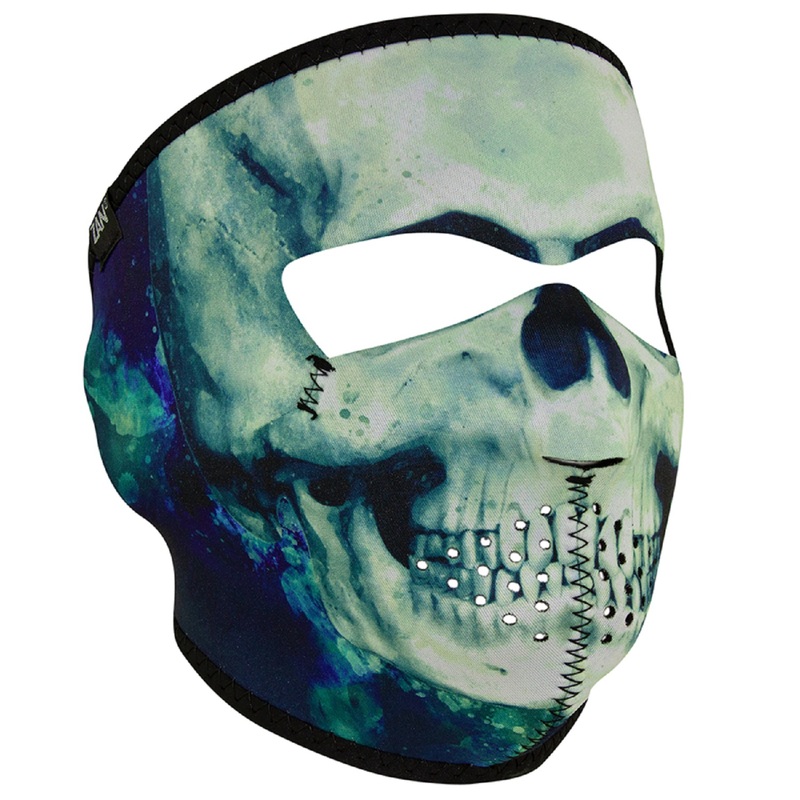 Like most Zanheadgear face masks, it has a black stretch nylon trim for added durability and clean finish. A hook and loop closure allows for adjustability and ensures great fit, and can even be lengthened with their Neoprene Extension Piece (sold separately).